Colleen Lowcock and Fr Mick Lowcock. COLIN Lowcock’s wish for his 100th birthday was to celebrate Mass with his family and friends – and that’s just what he did. 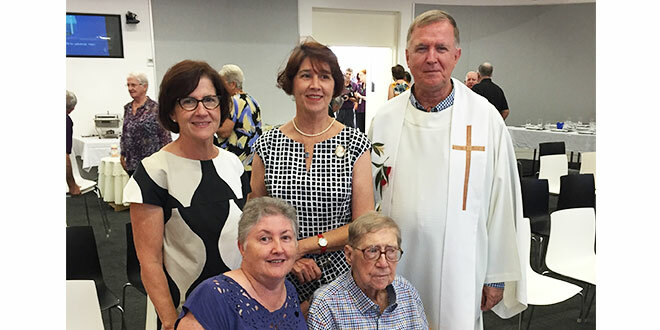 His son Fr Mick Lowcock, who is Townsville diocese’s administrator, celebrated Mass, and Colin’s other three children – Janice Weaver, Colleen Lowcock and Mercy Sister Mary Lowcock – were there, along with Janice’s four children and grandchild. Albert Colin Lowcock was born on May 27, 1916, in Bowen, and was the second-eldest of six children. Asked what was the most exciting thing to happen in Bowen when he was growing up, Colin said “getting electricity for the first time, it was wonderful for Bowen”. During his homily for his father’s 100th birthday Mass at the Mater Conference Centre in Townsville, Fr Lowcock said it was his dad’s great gift of faith that had formed him into the person he had become. “As Dad was coming to this milestone his mind has been on the end times; as you get closer to 100 then you must be getting closer to the end of time,” Fr Lowcock said. Many people shared stories about Colin and his life during the celebration. He worked in Bowen for the Burns Philp trading company before enlisting in the Army where he became a sergeant and was in Townsville when the Japanese bombed North Queensland. Mr Lowcock spent many years in Bowen working as a bookmaker and loves the town and community, especially the St Mary’s Church community. “In our family the love of God has been the foundation of our lives and certainly in Dad’s life,” Fr Lowcock said. More than 150 people gathered to celebrate Mr Lowcock’s birthday.